Club Penguin Cheats by Mimo777 Club Penguin Cheats by Mimo777: Herbert Blames Penguins For Hydra-Bot! 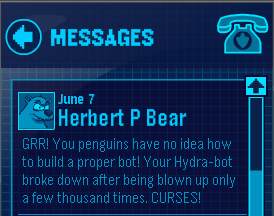 Herbert has sent us a new Club Penguin message! For real? Herbert blames us for not building a proper bot? That's kinda weird isn't it? I thought HERBERT build the Hydra-bot? This is a weird glitch! The shield pin is still at the dojo! Huge glitch! The shield pin is still at the dojo! No, Herbert took the hydra-bot from the medieval party and fixed it. That's why he didn't attack during the party. There's still room for one more level in System Defenders, too. He just doesn't have a brain. Didn't WE build the bot? I thought Herbert stole it from the medieval party! The field-ops WILL be back soon! A long time ago, I saw a sneak peak of an exclusive field-op message from one of Herbert's others robots saying something about attacking the lighthouse. Maybe they're trying to ruin the Music Jam! I dont know if this was just me but everything went very strange on the hydra bot game at one point, I was just about to play when 2 of the hydrabots were fighting us instead of 1!! It was crazy so i left came back and bam, same thing red and blue hydra bots were attacking me therefore i couldnt play . I wanted to know if this happend to anybody else? Yeah! I saw that too! I tried commenting about it but my comments haven't been showing up recently! Hopefully this comment will make it up. Waddle On! -_- didnt ANYONE notice the message? "The Hydra Bot broke after being exploded 1,000 times" i think thats what he said... but... isnt that good? i mean, usually, things break after being exploded 1 time.